The summit of the Coat of Arms consists of a streaming top-banner emblazoned with the name “Busongora Kingdom”. Beneath the Top Banner, and centred, is the shield Argent [white] and framed Or [gold]. There is no Crest, Torqe, or Top Mantling. On the shield [escutheon] is the upper [chief] and lower [base] charge. The charge-in-chief is constituted by the “Kogyere Maure”, which is a woman’s head [bust], Proper Sable [black], in profile, Medial [centred], and facing her own right, on ground of Argent. On her head Kogyere wears a band of beads Argent and in Bend dexter. [The word “Bend” in heraldry refers to “an ‘ordinary’ generally in the form of a broad diagonal stripe from top left (dexter chief) to bottom right (sinister base) of a shield or part of one.”] An “ordinary” is any of the simplest principal charges used in coats of arms (esp. chief, pale, bend, fess, bar, chevron, and saltire). The Kogyere Maure charge represents the Empress Kogyere I Rusija-Miryango, founder of Busongora Kingdom. In heraldic tradition the Maure head also symbolises Wisdom. On her head, in place of the conventional Maure Bandera [a white cloth-blind], she wears a band of beads, which is won by Basongora women and by Basongora Royals. On her neck she is wearing a lace and pendant of beads. Pendants and chokers are traditionally worn by both Basongora men and women. On the shield - beneath the Maure charge - is an ancient parchment on which is scripted the words “Psalm 23” - or the entire text of the Psalm if space avails. Psalm 23 is now associated with Judeo-Christian texts, but was originally a hymn to Osiris, whom the records of ancient Egyptians claim was a king and god, and whom they believed came from the area that is now Busongora. The name Osiris derives from the Rusongora name Warusiri. The dexter [right] supporter is a long-horn Huma cow, Chestnut in colour and Semi-Guardant. Cows are sacred to Basongora, and Basongora have always been associated with long-horn cattle. The cattle egret - known as “nyangye” - stands on top the cow. The egret is a symbol of throne of BuSongora. In ancient times the monarch of Busongora was also known by the title “E Nyangye” [The Egret]. The sinister [left] supporter for the shield is an adult Songora human male Figure proper vested Argent and Ochre, supporting in the dexter hand a special rod with a Y-shaped head and known as “e shando”. “E Shando” represents Justice and Order. Also in the dexter hand, together together with the shando, the man is holding a type of spear [omu’Taali] that reserved for use by Basongora royals. The spear also represents Defense. In the man is also carrying a yoke [omugamba] on his shoulders, and holding on to the yoke with his raised left arm. The yoke has slung upon it - at opposite ends - a glazed clay Censer [e Ki-Chunga] used to fumigate the milk jars and gourds, as well as a rounded conical wooden milk-pot [e Kyanzi]. Beneath the shield are two drums - one on the right and one on the left - representing royal drums. Basongora do not use drums for music. Drums are only kept in palaces as symbols of royal authority. The compartment consists of a landscape that includes as its central feature a representation of the Mount Rwenjura [Mount Rwenzori]. The mountain has summits and a glacier at its top. The top of the peak also frames the crescent moon - symbolizing its ancient renown as the “Mountains with the Moon”. The peak also frames the stars of the constellation Orion. Basongora refer to the Orion constallation as ekiterane cya "Njeru" - the constellation of the white cow. The three stars of Orion's belt are said to represent a white cow with two herders, one herder at its front and one at its rear. The dexter side of the compartment features a dung-beetle [scarab] and a bee. Scarabs are common in Busongora homesteads, and are considered a part of a healthy cattle kraal. Scarabs roll cow-dung into balls in which they lay eggs. The dexter side of the compartment also features - from the viewer’s extreme right towards the centre - a bee framed by a hive. The river flowing down the mountain’s centre and draining into the flat plain of the Great Rift Valley represents the fact that the Rwenjura mountain range is a major source of the Nile, as well as a source for many other rivers and lakes. The lower slopes of the mountain feature explosion craters which are known in Rusongora as “ebi-Korongo”. The plains are framed on each side by the escarpments of smaller mountain ranges. In the flat valley, on the right, is a Euphorbia Candelabra, and on the left is an acacia thorn-tree. The candelabra tree is sacred to the Basongora, whereas the acacia is the most common tree in the plains. Acacia wood and leaves have many uses, including as medication and also for material used in the construction of houses. The fore part of the lower plains consists of a lake and marshland, typically constuted by papyrus and palms. The plain also features red flowers. On the lake is a man with an oar piloting a canoe. Basongora were famed for their naval skills in ancient times. The sinister side of the compartment - beneath the man - there is a zither. The zither called “e Nanga” when strung, and “e kitara” when unstrung. The zither is the primary musical instrument of the Basongora. This side also features a chequered board/trough [muesho] used for playing an ancient chess variant [kisoro], for computation and vatic reckoning. Beneath the hills at the extreme ends of the plains, there are promontories - on opposite sides - on which are standing an elephant [on the right], and a lion [on the left]. Both animals are looking outward. The elephant and the lion are both symbols of royalty, and also represent the fact that Busongora is famous for the abundance of its wild animals. Traditionally Basongora do not hunt for game, and are protective of all animals. In modern times wild animals generally seek safety near Basongora homes in order to avoid hunters and poachers. The images used to represent the plants and instruments on the Coat of Arms - such as the Zither, chessboard, palm, papyrus, and candelabra - are faithful reproductions of the images used to decorate the houses of BaHuma from ancient times. Some of the images have been in use for over 5000 years. The Maure Head is attested in images that date back before 700 BC. For hundreds of years in subsequent centuries the Maure Head symbol was used on the flags of Africans in Africa, Arabia, Persia, Spain, Corsica, Sardinia. The Maure was the flag of the slave uprising and revolution in Haiti in the 1791. The streaming bottom banner consists of the motto scroll, and constitutes the base of the Coat of Arms. 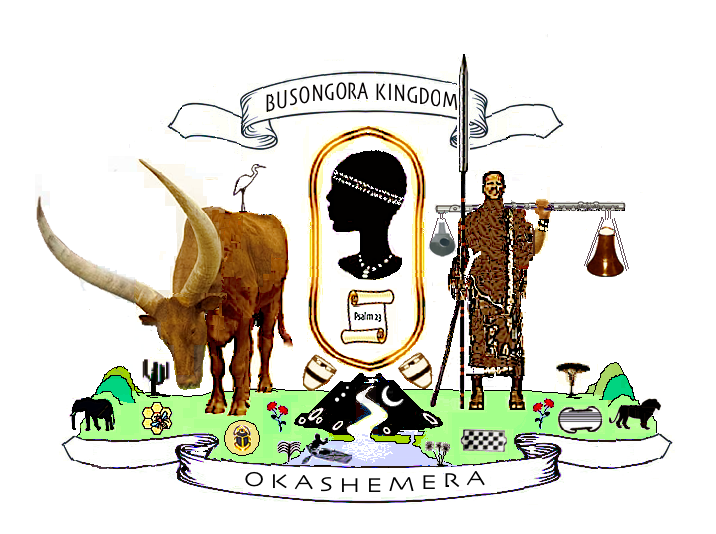 The motto “Okashemera” on the banner is a Shongora language phrase that translates in English as “Yours is Enduring Perfection - Grace, Goodness, Nobility or Beauty”, in reference to the majesty and grandeur of the Creator, and generally to all of God’s creation, but particularly to the land of Busongora and the deportment of its people. The beauty of Busongora is renown, and has remained a continuing source of wonder throughout the ages. As late as 2015, at least two of the lakes in Busongora were declared to be most beautiful in the world. Dated on Saturday 12 May 2012.